A few months later and I was sitting with my midwife reviewing my history and previous birth. When my midwife first told me she wanted to induce early I really fought it. I’m pro natural everything, and after a pitocin induced labour last time I so deeply wanted this one to be fully natural. ‘Just think about it,’ she told me as I left our appointment. I nodded that I’d consider it but in my heart I’d already decided it wasn’t happening. On the way home I spoke to Jared and he reframed the situation reminding me it wasn’t as clear cut as a choice between ‘natural’ and ‘not natural’. If we chose not to induce early it wasn’t like we could then guarantee natural. Potentially I’d go two weeks beyond my due date anyway and have to be induced, except with a bigger baby, or potentially her shoulder would get stuck too, or there could be a C section… I wasn’t running through all the options with fear, but trying to make the decision based on what it actually was. After a good chat and knowing we really trusted our midwife, we agreed it would be best to induce early. The nurse greeted us at the door of the maternity unit, weighed me, and checked us into our little room. I stood on the same scale almost exactly 2 years ago, feeling as equally not in labour as this time. I’d hoped it would be different. I’d spent days taking labour inducing herbal concoctions prior to checking in, but ultimately a healthy baby is all that matters so I was whole hearted and excited to start the process, drugs and all. Our midwife’s first move was an oral prostaglandin. I suited up in the starchy uncomfortable hospital gown, lay down as if something was going to happen, popped a pill and waited. Nada. ‘We’ll double your dose in 4 hours and that should do something.’ We counted down the minutes, popped more pills, took walks round the Christmassy hospital and waited. Again, nothing. The herb induced contractions stopped and I felt nothing. Nothing but hunger, discouragement, and a pressure to go into labour so that we didn’t get sent home. Thankfully our midwife popped her head round the curtain shortly after and was decisive: ‘Let’s have a baby, I’m not going to send you home without a baby.’ I didn’t realize until then that I’d felt the pressure but those words relaxed me completely. It could take as long as it needed, we were here to have a baby. Breathe. The hours ticked by but still nothing was happening by the night so the nurse inserted Cervadil promising it should yield something by the morning, maybe even labour they told me hopefully. Jared and I settled in with a salad from a local restaurant (the first of many on repeat!) and binged Netlix before getting an early night. I’ll be honest, having run up to labour at a fast pace in a slightly stressful environment with a house that was still a building site from a long overdue reno project as we left… a long night’s sleep and nothing happening for a day wasn’t sad. 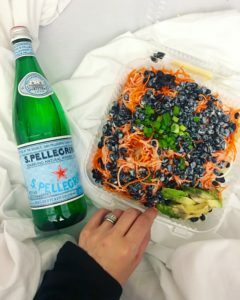 It was like a mini vacay with my husband, just dressed in an ugly hospital gown and IV lines, and with catered food I wouldn’t choose a hotel for, but if I’d been allowed a glass of red in that hospital bed it would have been pretty perfect. My scared-of-laboring-on-an-empty-stomach problems had me up in the night eating like a squirrel but aside from that we had a quiet uninterrupted sleep. When the sun rose though our little courtyard window, I wasn’t surprised to feel very not in labour and see a very flat line on the screen monitoring contractions. I honestly hadn’t expected the Cervadil to do anything, and it hadn’t. Still pregnant. took two whole boxes (these and these)to the hospital along with grass fed beef jerky bars, nuts, fruit, cold brew coffee drinks (these and these), chocolate, and coconut water and orange juice (this one is in glass and 100% organic) for labour hydration. Then our angel midwife came to check on me. I was geared up to start pitocin but she wanted to try one (final) alternative method saying if my body wasn’t ready pitocin wasn’t going to work. The thought of the last ditch pitocin not working made my heart sink completely, so we went with her recommendation and inserted a Foley Bulb. I did not like it. 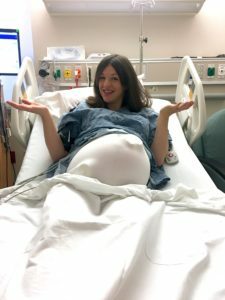 The goal is to put pressure on the cervix and cause dilation, with the other end strapped to your thigh to create tension… it just felt awkward. Not painful but it made me waddle with care to not pull it out! Nevertheless we unhooked the heart rate monitors and went out for a walk. We started in the hospital courtyard but figure of eights between picnic benches get boring pretty quickly so we just hit the roads and properly walked. Moving actually began to start some semi contractions but nothing that stayed if I even sat down, so we moved. And moved. And moved. article from The Atlantic about racism in America, and did some research about bathing babies right after birth – something I’d meant to do during pregnancy and never done. (It’s now more common not to bath babies for up to a day after birth, it’s even recommended by WHO but I wanted to know more, I decided I wanted to wait to bath her, which is actually now standard practice in our hospital I later discovered.) Jared came home and we binged Crown on Netlifx and ate salads and dark chocolate while the nurses slowly increased the Pitocin levels. Because my water broke (while getting takeout) with my first labour, I’d had to be induced with Pitocin and I’d hoped that this time it wouldn’t take that. However, thirty hours deep into trying to get into labor, I was ready for just about whatever method they wanted to use to get this baby out. So at 1.30pm they hooked up the Pitocin line and a little digital ‘2’ appeared on the screen showing the level they’d slowly crank up. My body apparently just loves Pitocin and within minutes I was contracting and the Foley bulb fell out showing I was 4cm dilated. I was relieved to have that thing gone and to feel free to move again, after being strapped up with that the IV line I’d dreaded didn’t even bother me. I was finally feeling real and regular contractions and I was so excited and ready. Ready. ‘Later please.’ I responded in a split second and Jared looked at me, ‘Wait, now right? Isn’t now better than being wheeled down mid contractions later?’ I knew he was right but I realized, I was nervous. Nervous when it started to feel real. I didn’t want to see the room in which I’d actually push, the room where I knew I’d feel pain. I was relieved to feel contractions but not ready for the real thing. After Clayton’s delivery, literally within minutes I wanted to go back and do the same thing again. Days later I asked Jared, ‘Did it hurt me? I don’t really remember.’ Leaving the hospital was hard for me, I was so attached to the place where I went though that deeply emotional experience. Back in the same hospital, same gown, same rooms, standing feeling contractions and a little fear I tried to harness those feeling from before. THIS moment was something I wanted to go back and do again, THIS moment was the one that two years ago I couldn’t wait to be back in. And there I was. Back in it, doing it again and I determined I wouldn’t let fear steal any of the wonder I knew was in these hours. I wanted to treasure what I knew, in hours, I would want to relive. 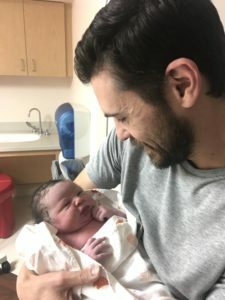 ‘Ok yes, let’s go down there now.’ We picked up all our bags, Jared took them to the post labour recovery room, and I walked with the nurse, wheeling my pitocin drip down the short corridor to the delivery room. It’s a larger room, with a delivery ball, a bed, all the same monitors, and a little bassinet under a light ready for a baby. I glanced across to another side table and there was a big blue plastic sealed package. I thought maybe it was something inflatable, a tub? A ball? I read the label: ‘Vaginal Delivery Kit.’ This was really happening. I didn’t feel ready, all the little fears came back but again I reminded myself: you love this! You were built for this! This is one of the best moments of your life, soak it up and don’t let fear take it. 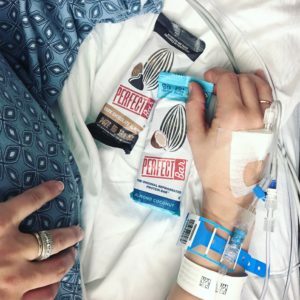 We hung out, picked our way around another brown tray hospital meal, sent update videos to our family, snacked on almonds and hung out. All through it I hopped from foot to foot and danced around the delivery room. It was the only way I could keep contractions consistent. I tried sitting on the ball and they slowed right now but I wasn’t letting that happen again so I danced back and forth and up and down the room determined to see those little lines rise and fall on the monitor. At around 5.45pm our midwife came in to discuss the plan. The only words I really remember as she sat on the end of the delivery room bed were, ‘you’re still a 5, so we can do Pitocin though the night…’ Sorry, through the NIGHT?! No. Way. I was all psyched up to have a baby tonight, I thought I’d lose all the momentum if we went though another night. I couldn’t face that. Give me another option. ‘Alternatively,’ she went on, ‘we can break your water. 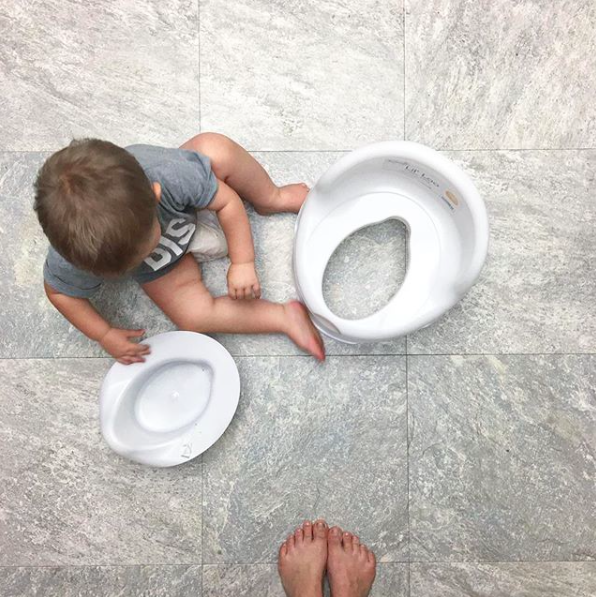 Then we’re committed.’ I’d had a friend give birth weeks before after having her water broken and hearing her describe the sudden rush of intensity made me shy away from that route, but there was one thing I wasn’t up for and that was going through the night. So I tried to put my nervousness aside and harness my determination to see this baby girl that night as I told my midwife, bring it on, break my water, let’s have a baby. I’ll say it’s a little intimidating to have someone reach towards you with a long hook, but the actual breaking didn’t feel like much. I felt a little warm water rush but nothing else aside from extra adrenaline knowing there was no turning back, this was about to kick in and happen. 6.12pm I was only at a 5 when Pam our midwife broke my water, but real contractions started quickly and I felt satisfying relief as we finally watched the monitor line give us a rhythmic rise and fall and I felt the pressure knowing we were truly moving closer. We kept eating almonds and watching the monitor. Within the hour I was having contractions that took my concentration, and I was quickly done with food, done sending updates, this was happening. I started squatting during contractions to relieve the pressure and that made them ok but my legs got tired, so I sat on the ball in between to rest. We kept up that routine for probably an hour; deep squatting, Jared talking me through the contractions, resting on the ball. I needed to focus and we turned down the lights to have less stimulation. I needed to know exactly what was going on all the time, it kept my head clear, so Jared talked me though each contraction as he watched the monitor. ‘Ok you’re starting another one, here we go……. we’re coming to the top, almost there, you’re almost going down again, ok you’ve hit the top, it’s going down…..’ As soon as each contraction was going down it was instantly completely bearable to me, labour is as much a psychological game as physical. Even once I was pushing, between contractions when I could breathe and talk I mostly asked for information. ‘What’s happening, what are you saying? What can you see? Tell me about the contractions… am I having one? I can’t feel them, can I push?…’ I needed talking through every single moment to feel in control and calm. After an hour of the squat/rest on the ball routine the contractions intensified, they began to get hard; less manageable. 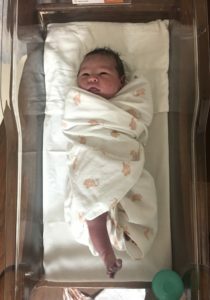 I’d run to the bathroom so many time since coming into the delivery room – timing the trips between contractions, but I knew I couldn’t move any more. ‘Get a pad, put it under me, I’m going to pee.’ Half of my brain was saying ‘You’re an idiot, go to the bathroom, you’re peeing on the floor and it’s ridiculous and humiliating.’ The other half was saying, ‘Do not move anywhere, focus in on contractions and do not walk to the bathroom.’ But you get to do whatever you need in labour, whatever eases it, whatever makes it possible, and for me that was peeing on a large pad on the floor. The joys and humility of labour. It’s strange, it’s the single most empowering and strengthening experience I’ve been through and at the same time some of the most vulnerable, helpless and humbling moments. After I showered at the end, the nurse knelt down to wipe dried blood off my leg that I hadn’t been able to reach in the shower. I stood there naked, torn and dizzy as she rubbed a white towel on my calf so I could walk back to my baby clean. Nurses are incredible. Labour is humbling. So I peed on the floor. Then right back into another contraction. The pressure and discomfort where hard to avoid, no movement helped completely and so began the mental game. 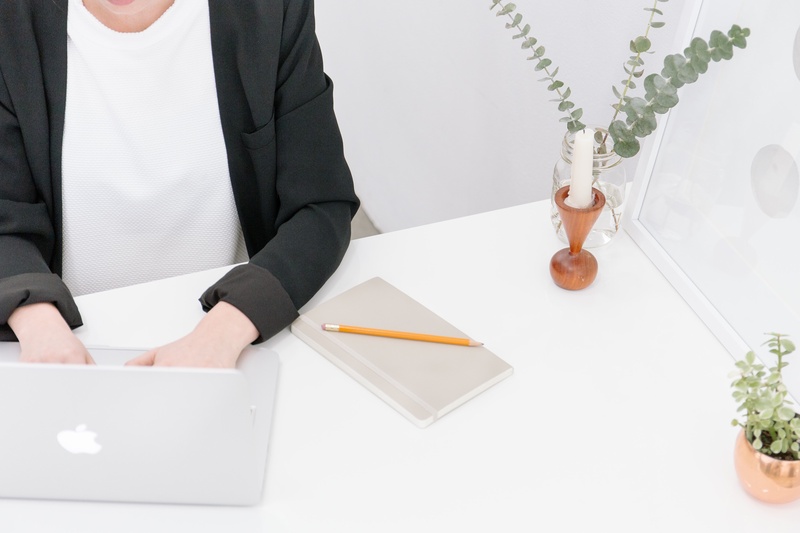 Listen to the rise and fall…focus… breathe.. try to move to a position that helps… remember you actually love this moment and tell yourself you’ll want to go back to it as soon as it’s done. Whatever it takes. My legs were really tiring, I’d been doing deep squats for an hour and I didn’t have much left, I clambered onto the bed between what were now intense contractions and grabbed the bed head as another hit. I couldn’t get away from the pain anymore at all. With the next contraction I was gasping for breath, I felt like I couldn’t get air into my lungs and it panicked me. ‘I feel like I can’t breath.’ I squeezed the words out between contractions. I actually don’t think the nurse even flinched or batted an eyelid. Neither did Jared. Deep down it reassured me that it was all ok but I wanted to be mad for a second, ‘Did you hear I don’t think I can breath?’ Except I knew I obviously could, and, next contraction, move on. A few contractions on I was moaning, moving my hips to try and escape the intensity but failing, on all fours in the bed in that darkened room and as the pain of the next contraction hit that little though flickered though my mind… epiduuuuuuural. Followed by, I’m adopting all future kids, I’m not doing this again, why did I not get an epidural? 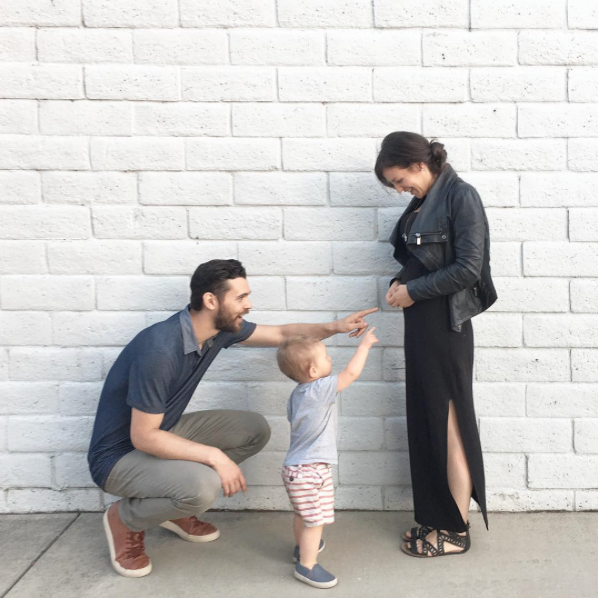 As the next contraction slowly tailored off on the screen I turned to Jared, ‘Babe, this isn’t the “I can’t do this” moment (aka transition) but I’m not sure how much more of this I can take.’ I didn’t know I wasn’t going to have to take much more. When my midwife heard that she checked me again, ‘you’re a 6.5.’ I wasn’t thinking about numbers but I’d hoped for all that I’d be further on. Suddenly I felt like I needed to poop. Or push? No, just the bathroom. I told Pam – maybe I have to poop, or push, I’m only a 6.5 so probably poop? We went through another contraction and it got stronger. That did NOT feel possible. It felt like I HAD to go to the bathroom more intensely than every before but I was telling my body ‘no’ while it was exploding and I was feeling weak to resist. All my mind was focused on not doing what my body was telling me to do. Shallow breaths through a contraction… and another. ‘I can’t not push.’ I was frantic, I wasn’t going to be able to hold off though the intensity of another contraction, but 6.5? I was SO far out from pushing. How could I do this? Pam checked me again before the next one hit. Then THE words: ‘You can push whenever you’re ready!’ I was confused. ‘I’m a 10, I can push? When?’ Two contractions ago I was 6.5?! 8.20pm. 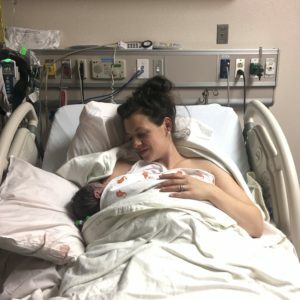 People talk about the relief of being able to push and I didn’t feel it my first labour (there’s no relief in 3+ hours of pushing!) but this time oh how sweet it was. Like really sweet and the best feeling thing ever. It suddenly felt like I wasn’t fighting anymore, it felt perfect and natural and calm and right, the pain and intensity went and I was down on my elbows on the bed and I pushed with all my might. Actually knowing how to push is a game changer. I pulled on everything I’d learned last time. 1) don’t hold my breath 2) let pressure out through my mouth, focus everything in on the other end, pull everything in and focus it on pushing that baby. 3) 3 pushes with each contraction: the first to make up ground lost between contractions, the second to advance it, the third to hold it to the next contraction. Those were the keys for me. I pushed pushed pushed, I breathed, I signaled for orange juice between contractions, I asked questions about what was happening, I pushed pushed pushed. It was probably only 10 contractions of pushing and Pam said ‘we’ve got some long hair!’ They could see her little head! Oh the motivation! Zone in, orange juice, breathe, push push push. The calm perfection of getting to give into the urge to push gave way to intensity again but still an intensity I’d choose over contraptions any day. 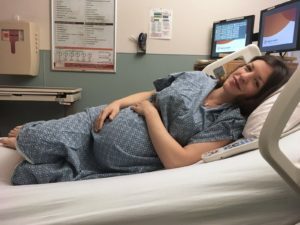 There was no let up in pressure between contractions but I felt no pain. Just intensity, and the pressure of her little head stretching my body to capacity. And then wait, nope. Not over. Not at all. There’s a placenta still inside me. ‘One more push, sorry.’ Pam reminded me as a nurse came towards my tummy with hands that I knew where about to pummel me in a way that hurts so much less than labour but somehow in the moment appears so much worse! But pushing it out feels so satisfying. Like you didn’t know you needed it gone but it feels so right when it’s out. ‘Did I tear?’ I did, she told me, just along my episiotomy line from last time and so ensued the stitching up which I was less of a wimp about this time around! I cried and cried, a blubbering teary mess looking at my baby, those first photos of me I look completely confused to be holding a baby. After 30 hours of waiting it was basically a three hour labour with 25 minutes of pushing. I felt mentally present through the whole thing which I didn’t have last time, so it all felt so much more real. And the shock took a long time to move past. She drank for the best part of 2 hours as I lay there looking at her and her long hair, looking at Jared, still questioning the whole thing. In the shock I genuinely wanted to use the word ‘easy’ for what had just happened. No labour is easy, and that one wasn’t, but compared with what I expected I didn’t know it could go that simply. If you’ve had a hard labour there is hope. My two could not have been more different. 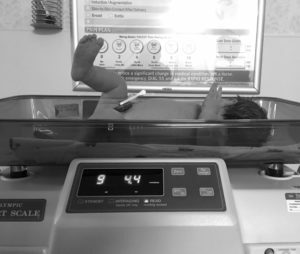 pummeling my stomach (ouch) they popped her on the scales: 9lbs 4oz of fresh red little babe. 21 inches long. And perfect. Then suddenly I was freezing. In one second I went from comfortable to loud teeth chattering, shaking and freezing. I couldn’t get warm and I panicked. I asked for more and more blankets but I couldn’t get warm, I made Jared cover every inch of skin that was showing but my teeth still loudly chattered. They told me my vitals were still ok and piled on more blankets as I tried to be calm and breath. After a few minutes I got warm and my teeth stopped uncontrollably chattering. Then a few more minutes later it happened again, teeth, shivering, more blankets, I knew I was fine so I closed my eyes and just breathed in and out slowly to calm myself. 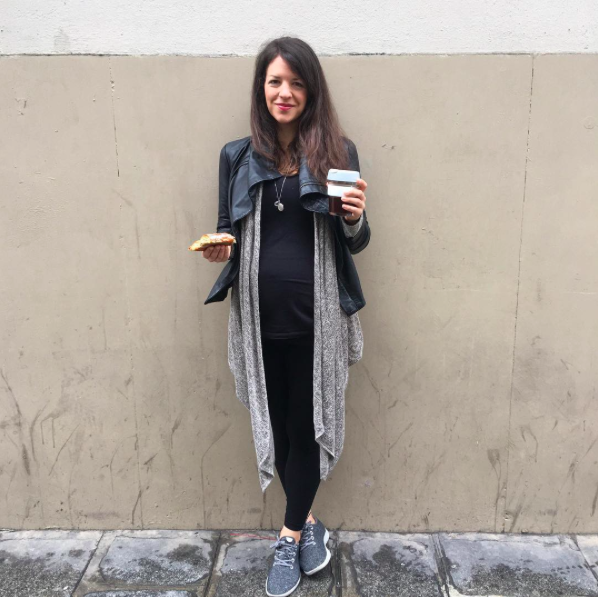 I warmed up, then sweated under all the blankets… well anything at all can happen in labour. And in the days to come I knew there would be night sweats just like this, oh the journey. ‘Whenever you’re ready you can take a shower, just let me know.’ But my parents were about to set off for the plane so we sat on the bed in a pile of blood and sheets and facetimed them quickly, crying buckets of tears again as I showed them my girl and told them her name: Rosemary “Roey” Gold. After my grandmother and my mother – and a name that has so much meaning for us. Then I got up to take a shower, I forgot to call the nurse first and so covered the floor, and myself, in blood. Oops. But I made it into the shower and it felt so great, and then also like I was going to faint. The nurse came to hold me, they made me shower with the door open in case I got faint again… I think arms above heads after labour is just a bad plan for me. But I managed, and emerged dizzy but with clean hair and collapsed into a wheelchair they pulled out for me. We only had to go a few yards for the recovery room but I happily sunk down into the chair, surprised by how little it actually hurt to sit and we wheeled away down the corridor. 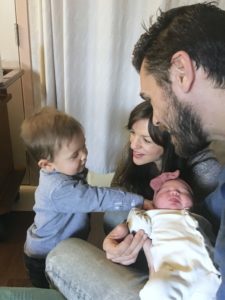 ‘When we go past that button you can press it to let the hospiral know there’s a new baby.’ I pulled out my phone to record the moment, pushed the button and savored every little chime of the song that rings out, I cried as it played and we wheeled our little Roey girl into the room for our first night together. The first night of the rest of our lives. 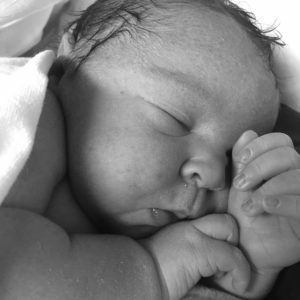 Read Clayton Oak – A Birth Story HERE. 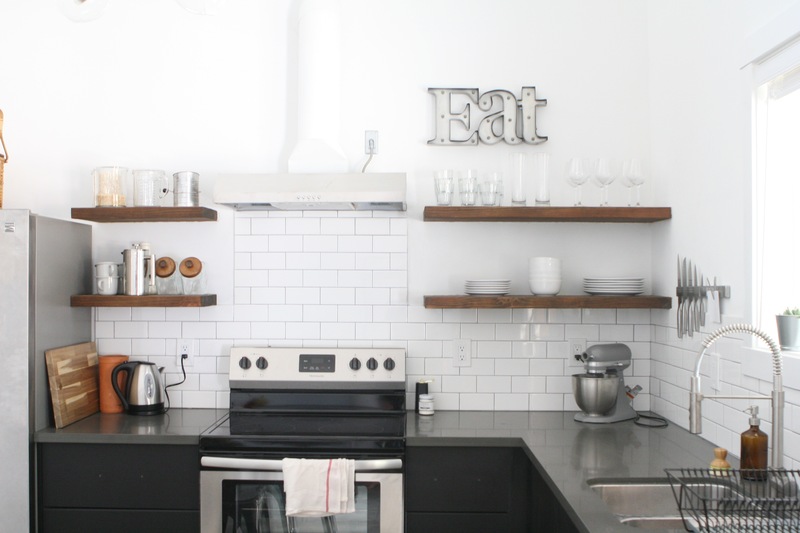 Find my Healthy Home Baby Shower Checklist HERE. 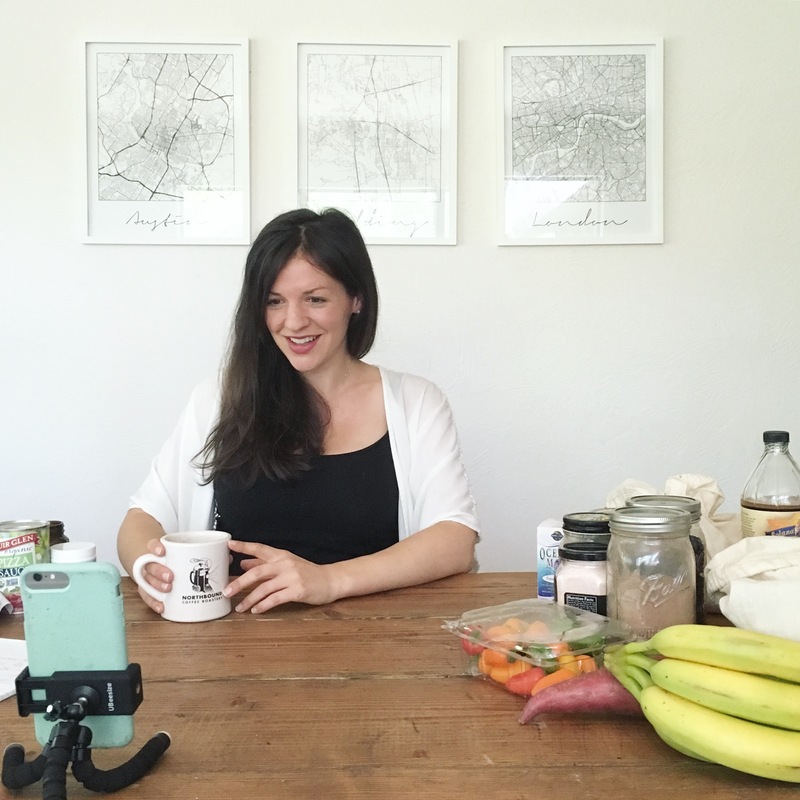 “Have I practically been loving this body well, and daily treating it the way I know I want to?” That’s my question as I stand in front of the mirror….